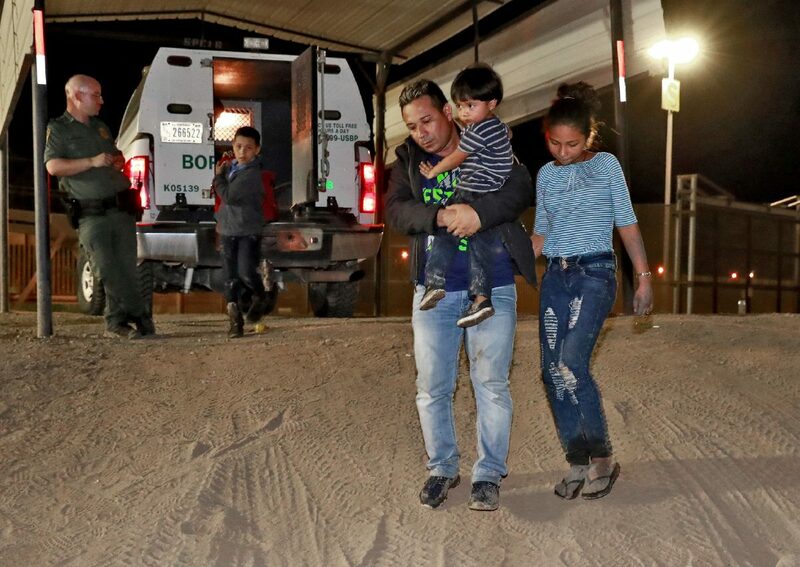 A Honduran man carries his 3-year-old son as his daughter and other son follow to a transport vehicle after being detained by U.S. Customs and Border Patrol agents Wednesday, July 18, 2018 in San Luis, Ariz. The four were arrested by a U.S. Border Patrol agent who spotted them trying to cross the international border. Agents opened the gate in the fence to the right when they spotted the group crossing a canal. The executive order President Donald Trump implemented in late June didn’t do much to deter family units from attempting to come into the U.S., according to figures released Wednesday by the U.S. Department of Homeland Security. In July, U.S. Border Patrol agents arrested 9,250 family units, down slightly from June’s number of 9,434 family units arrested, the data shows. In fiscal year 2017, agents arrested 3,389 family units in July and 2,322 family units in June, data shows. In late June, Trump signed an order ending the separation of children from their parents that was part of the “zero tolerance” policy announced in April. The policy was implemented beginning in May to deter, as the administration put it, the continued migration of Central American families into the U.S. The policy, announced by U.S. Attorney General Jeff Sessions, urged prosecutors to put priority on all illegal entry and reentry cases, even those defendants who did not have a prior criminal record. But zero tolerance led to high caseloads for prosecutors and public defenders working along the U.S.-Mexico border, as Border Patrol officials referred all illegal entry cases, even misdemeanor cases, for prosecution — leading to the separation of children from their parents. The Southwest Border Migration numbers also showed that arrests were down for the second consecutive month in July, with 31,303 arrests compared to the more than 34,000 people arrested in June, statistics show. Agents arrested 18,187 people in July and 16,087 people in June, according to data for the 2017 fiscal year. The Southwest Border is made up of nine sectors, including Big Bend, Del Rio, El Centro, El Paso, Laredo, Rio Grande, San Diego, Tucson and Yuma.